Cellulite is also known as adiposis edematosa, dermopanniculosis deformans, status protrusus cutis, and gynoid lipodystrophy in the medical field and as orange peel syndrome, cottage cheese skin, hail damage, and the mattress phenomenon in colloquial language. Hormonal factors – hormones likely play an important role in cellulite development. Many believe oestroge, insulin, noradrenaline, thyroid hormones, and prolactin are part of the cellulite production process. Diet – people who eat too much fat, carbohydrates or salt and too little fibre are likely to have greater amounts of cellulite. 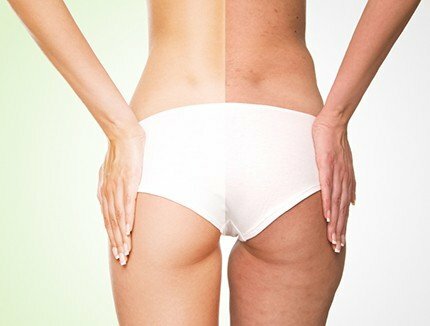 How can cellulite be reduced? At Hans Place Practice we are now providing an effective treatment in the reduction of Cellulite. Velashape 3 is a third generation treatment device which uses infra red and radio frequency technology to reduce cellulite and smooth and tighten the skin. Treatment is undertaken by our resident therapist and a course of 3 treatments per area of concern is recommended. A two week gap between each treatment is necessary and results can be seen from 1 to 10 weeks. The treatment lasts around 10 months depending on the patient and can be topped up with subsequent treatments such as Velashape 3 “Once” which is a one off treatment, perfect for that special occasion or holiday where you want to look your best in that new dress or bikini. The treatment works by heating the collagen deep within the dermis and creating a “shrinking” and “smoothing” effect on the skin.